Recartografías organized between the 11th and 13th February at the Faculty of Economics of the University of Valencia a seminar on the topic of degrowth and common-pool resources management with the title "Growing again? dismantling discourses and constructing alternatives. More than 30 Master and Bsc students of environmental sciencies, geography and sociology of the University of Valencia attender the seminar, which had a first part of two sessions at the University of Valencia, and a second part with a visit to Mas Blanco projects. 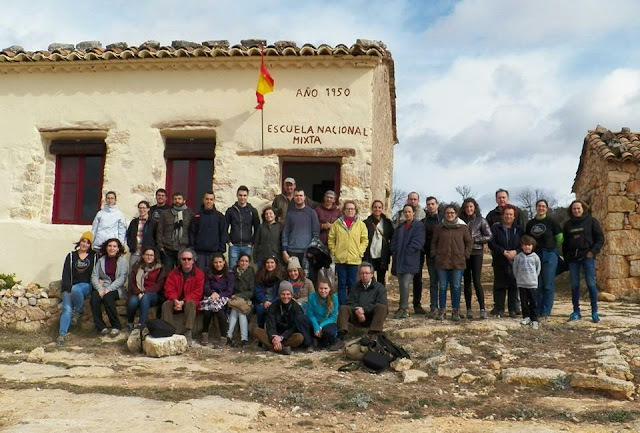 Different specialists and activists gave presentations about ecology economics, land stewardship, the future of rural spaces, degrowth, social currencies, cooperativism, alternative planning etc. Some former inhabitants of Mas Blanco joined us in the excursion to the village.